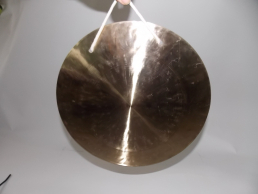 Wind gongs (also known as Feng or Lion Gongs) are flat bronze discs, with little fundamental pitch, heavy tuned overtones, and long sustain. They are most commonly made of B20 bronze, but can also be made of M63 brass or NS12 nickel-silver. 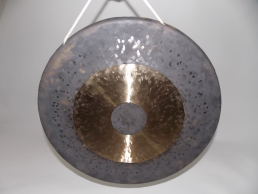 Traditionally, a wind gong is played with a large soft mallet, which gives it a roaring crash to match their namesake. 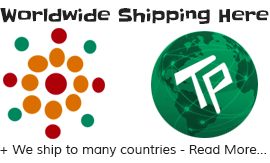 They are lathed on both sides and are medium to large in size, typically 15″ to 22″ but sizes from 7″ to 40″ are available. The 22″ size is most popular due to its portability and large sound. They are commonly used by drum-kit drummers in rock music. Played with a nylon tip drumstick they sound rather like the coil chimes in a mantle clock. Some have holes in the centre, but they are mounted like all suspended gongs by other holes near the rim. The smaller sizes (7″-12″) have a more bell-like tone due to their thickness and small diameter.